In the Late Cretaceous and Palaeocene  the Iceland Plume or ‘hot spot’ impinged on the base of the lithosphere and produced huge volumes of magma. Called the Thulean Volcanic Province, it was in the present area of the North Atlantic Ocean between Greenland and Europe (P947859). Although the plume centre was probably located in Greenland (P947860), associated magmatism extended over an area with a diameter in excess of 2000 km . Thus, igneous provinces occurring as far apart as west Greenland, northwest Scotland and Northern Ireland were all produced by this plume . However, magmatic activity was not constant in the volcanic province as there is evidence of two major pulses with peaks at about 59 and 55Ma . 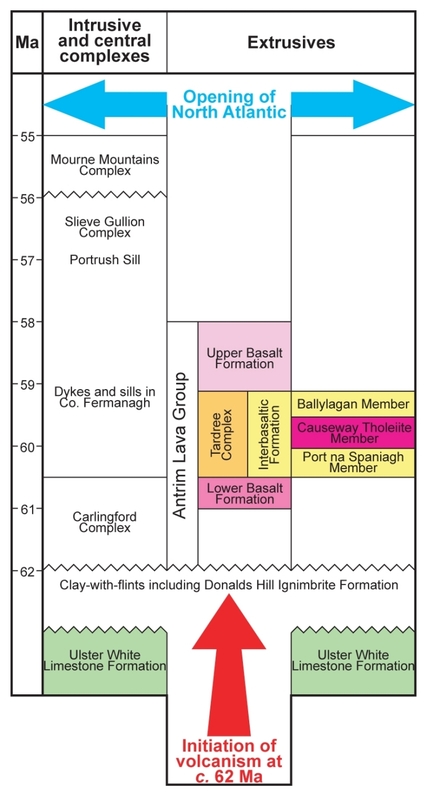 Indications of an older phase of magmatic activity at about 62Ma are based on the dating of centres outside Northern Ireland. At present in the North Atlantic region, volcanic activity is still related to the Iceland Plume. It is located beneath the mid-Atlantic Ridge, where oceanic crust is still forming, and is evident in the active surface volcanism on Iceland. The stark volcanic landscape of that island offers insights into the origin of rock types found in the Antrim Lava Group in Northern Ireland and examples of the volcanic processes that formed them such as the fissure eruptions and lava flows of Krafla. 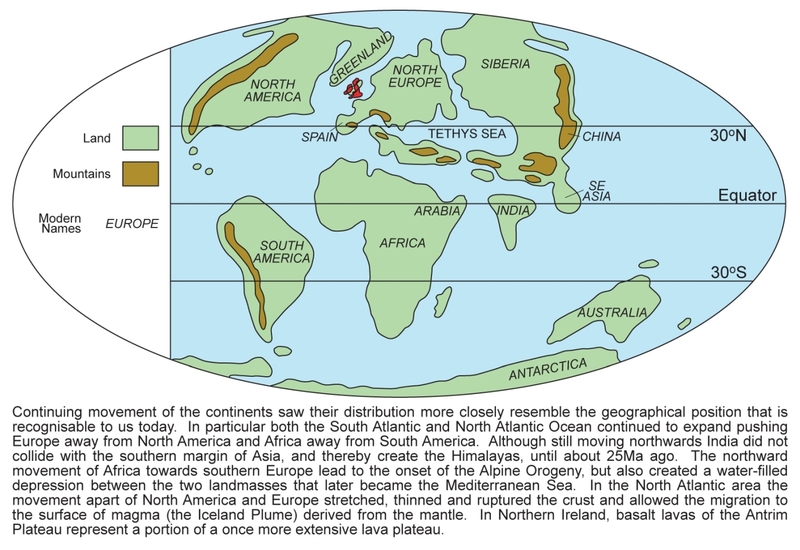 During the Palaeocene, the continental crust of Ireland was influenced by a syn-magmatic extensional tectonic regime related to an early attempt to open the North Atlantic Ocean between Greenland and Europe . Extension, dilation and uplift of the crust were linked to doming caused by the rise of hot magma fed by the Iceland Plume. This was ultimately responsible for the initial opening of the North Atlantic Ocean by seafloor spreading at the mid-Atlantic Ridge in the latest Palaeocene-early Eocene, about 55Ma ago (P948097). 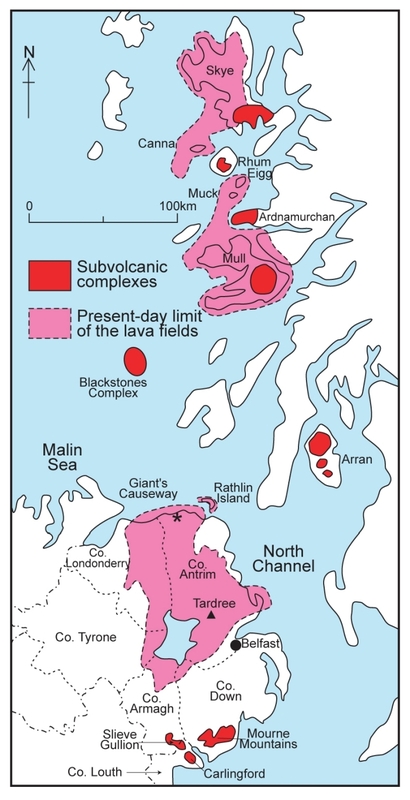 Between c. 62 and 55Ma the Northern Ireland sector of the North Atlantic Igneous Province experienced plume-related igneous activity which led to the development of lava fields and intrusive or central complexes . The largest remnant of that igneous province in Britain and Ireland forms the Antrim Plateau although lava fields and central complexes occur in western Scotland (P947861). Offshore Palaeogene volcanic centres occur in the Blackstones Bank, and extend the igneous province northwest to the Rockall Trough and south to Lundy Island in the Bristol Channel. ↑ White, R S. 1989. 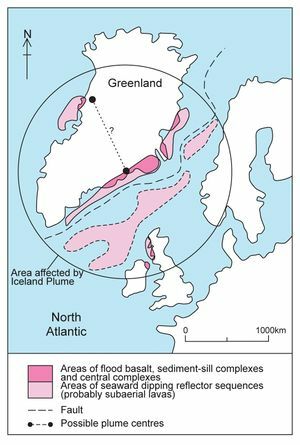 Initiation of the Iceland Plume and opening of the North Atlantic Margins. In: Tankard, A J, and Balkwill, H R. (eds.). Extensional Tectonics and Stratigraphy of the North Atlantic Margins. American Association of Petroleum Geologists Memoir, 46, 149–54. ↑ Ritchie, J D, Gatliff, R W, and Richards, P C. 1999. Early Tertiary magmatism in the offshore NW UK margin and surrounds. In: Fleet, A J, and Boldy, S A R (eds.). Petroleum Geology of Northwest Europe: Proceedings of the 5th Conference, 573–84. © Petroleum Geology ’86 Ltd. Published by the Geological Society, London. ↑ Dickin, A P. 1988. The North Atlantic Tertiary Province. In: Macdougall, J D (ed.). Continental Flood Basalts. Kinwer Academic Publishers, 111–49. ↑ Geoffroy, L, Bergerat, F, and Angelier, J. 1996. Brittle tectonism in relation to the Palaeogene evolution of the Thulean/NE Atlantic domain: a study in Ulster. Geological Journal, 31, 259–69. ↑ Bell, B R, and Jolley, D W. 1997. Application of palynological data to the chronology of the Palaeogene lava fields of the British Province: implications for magmatic stratigraphy. Journal of the Geological Society, London, 154, 701–708. This page was last modified on 25 September 2017, at 13:46.